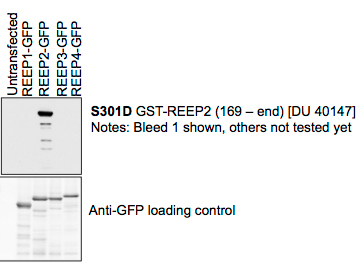 HEK293 cells lysates (30 μg) transiently expressing the four REEP-GFP proteins, as indicated, were subject to Western blotting using 0.2 μg/ml antibody in 5% BSA in TBST either overnight at 4oC or for 1 h at room temperature. Use at higher concentrations led to some cross-recognition of other family members. The GFP tag is at the C-terminus of these proteins, because the N-terminal region is in the cytoplasmic leaflet of the ER membrane.